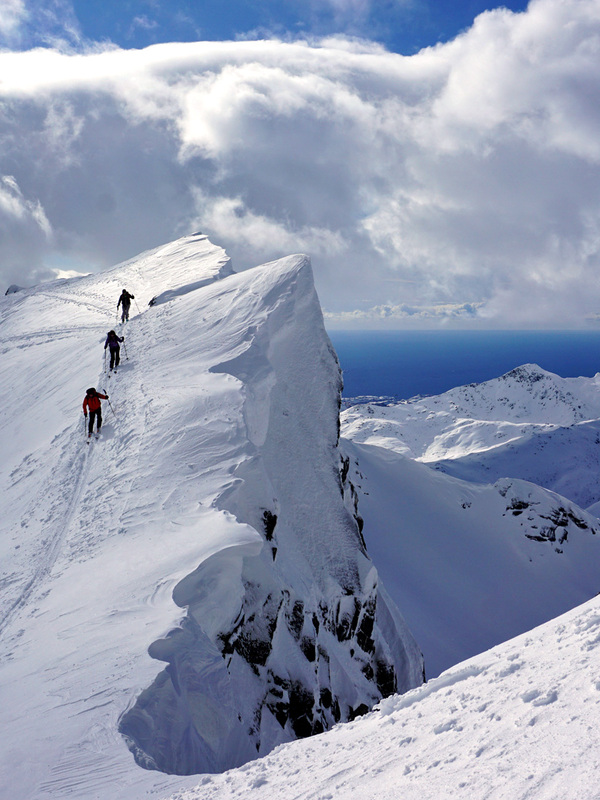 Lofoten has become a popular ski touring destination, with good reason! Otherworldly beauty rewards the effort of every climb. The vast and complex terrain offers a wide choice of aspects, steepness, and length and difficulty of each day's tour. 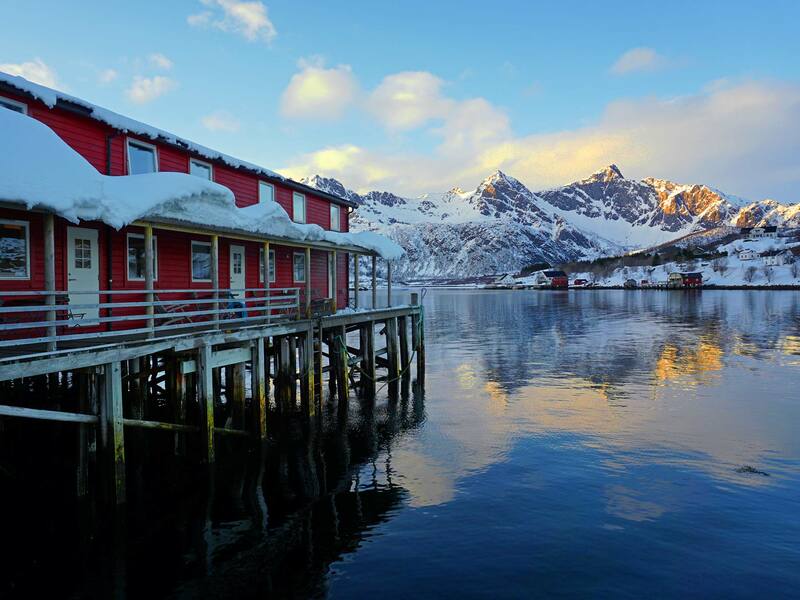 The comfort and support of our "base camp" at the Lofoten Ski Lodge, makes every day a true vacation from start to finish. We offer this trip as visiting guides, at the kind invitation of Seth Hobby, owner and operator of Northern Alpine Guides. His support and hospitality at the Ski Lodge make this opportunity possible for us and our guests. We propose 6 days of skiing in our standard itinerary, but as it is also available as a private trip, it can be be shortened or extended as desired. That said, 6 days is probably the minimum one would want, to explore and enjoy what this area has to offer, and to compensate for the long trip (for most North Americans at any rate) required to get there! We target late March or very early April for this tour. Days are getting longer and warmer by then, yet typically still cold enough that good, wintry snow conditions remain likely. For more detail and to get a feel for the character of this place and this trip, scroll down to view the "Lofoten Logistics" information, and/or click on the link below to see pictures from our previous trip. Also, please don't hesitate to contact us for more information, we would love to hear from you. We hope you'll consider joining us in Norway next season! The Northern Lights, as seen from Cabin 8. The Lofoten Ski Lodge is most readily accessed from the Svolvær Airport (SVJ). A 20 km taxi ride brings you to the Lodge. Alternatively, the Evenes Airport (EVE) is about 3 hours distant by car. Since we hire cars to get us from the lodge to the ski tours, if our arrival time and airport is similar to yours, we can give you a ride. Generally, it is easy to get from Oslo to the Lodge in about half a day, depending on arrival airport. From mainland Europe it is a long day. And from North America, two days. Our ski touring days all begin with breakfast at 8 am. Normally we are on the road at 9 am, and in our skis shortly thereafter. The tours vary in length, but most typically we are back at the Lodge in the mid to late afternoon — in time for a quick shower and the 4 to 6 "waffle hour" (not to be missed). Almost without exception, we start at, or very close to sea level. We climb quickly up through tree line at about 200 meters, and are up in the alpine for the duration of the tour. Most tours involve a ski summit, some requiring a bit of walking or easy climbing. Typical summit heights range from 700 meters above sea level, to 900 meters. Most folks spend the night of the last skiing day in the Lodge, and depart the following morning. We'll be returning the rental cars, and if your flights coincide with ours we can pool. With an early departure from the Lodge in the morning, it is possible to continue on to either Europe, or North America the same day. This trip requires a good level of fitness and very good skiing abilities. On a number of days the total elevation gained is over 3000 feet. Being in good shape will ensure you have enough energy to manage (and have great fun as well!) on the long descents which follow. The reason that skiing skills must be at an advanced to expert level has more to do with the conservation and expenditure of energy over a long day than the absolute technical difficulty of the skiing. There are a few steep sections, but for the most part the slopes are not overly steep. The challenge comes in managing poor snow conditions (heavy wet snow, crud or breakable crust) and not losing too much energy or risking injury in the process. Great skiers look like they are hardly working, and this is in fact the case. 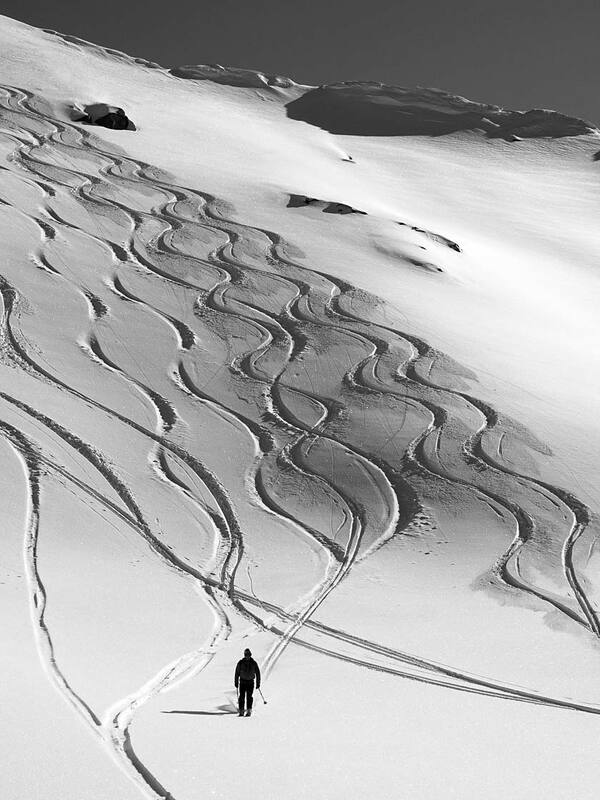 If your skiing is not up to par you will spend far, far more energy than a better skier. Skiing down the final slopes to the Morfjorden. The fishing village of Henningsvær.